This post entry is a submission to this contest organized by Nuffnang and McDonald's. 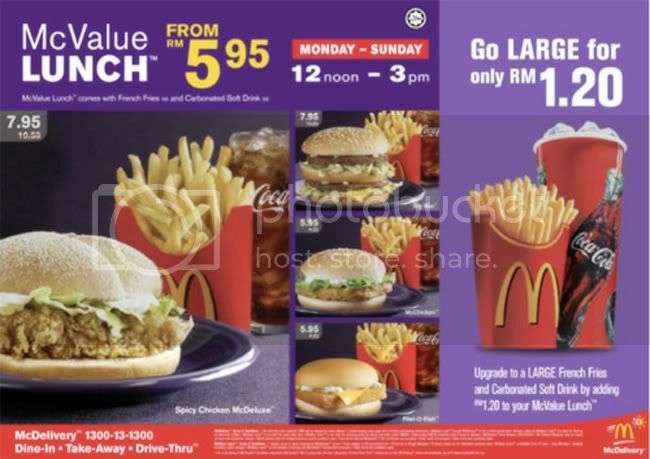 You might have or not heard about the McValue LUNCHTM promotion. If you have not, I have composed an edgy acoustic-rock song to summarize the promotion as below. You may scroll the lyrics down or up via hovering over the related arrows. You could even use delivery. 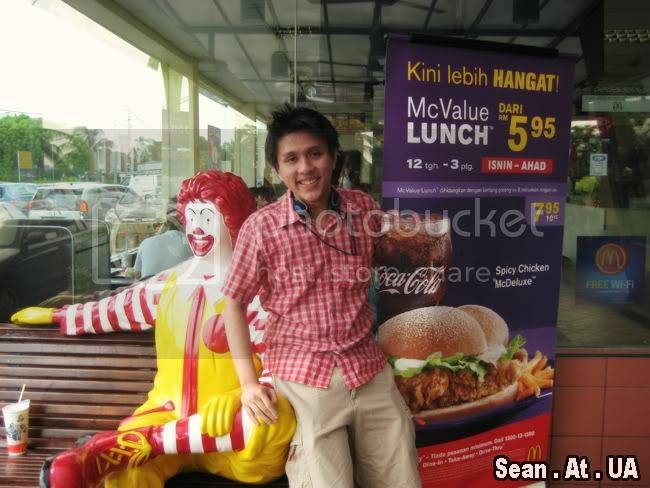 Yesterday, I went to MCDonald's SS15, Subang Jaya the Drive-Thru branch. Ordered this one. Large set. Then, waited with a friend YJ, for my friends to come. All avid practitioners of "Malaysian-Timing". LOL. Malaysian Timing is a concept whereby one must assume additional given buffer of at least 30 minutes from the verbally-agreed appointed time between two parties. 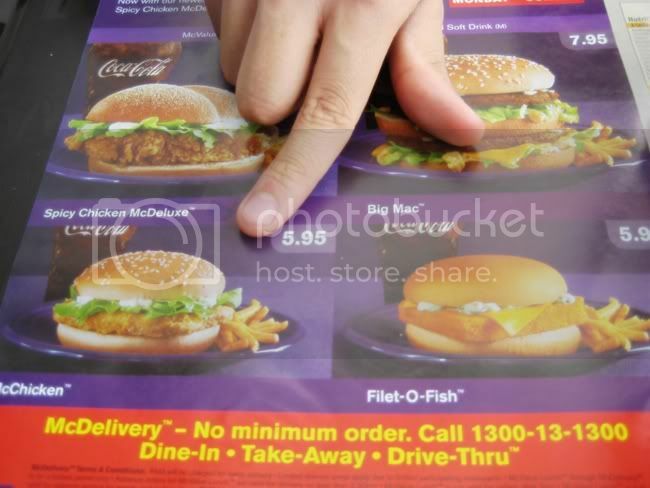 The issue/problem/dilemma/conflict question is when a friend arrives only at 3 P.M but wants to have their McValue LunchTM. How to order? Could it be... Have a calculated contingency plan ? Try to negotiate with the branch manager? Watch the video below to see the solution. The recording is a re-constructed depiction of the scene. Yes, the solution is the obvious. The answer is to have an understanding friend. From the video scene, we see that being late (overrun-ed time), means potentially missing out opportunity to eat(scope/goal). With the cheaper price of McValue LunchTM price(money), I was incentive-fied to order one more reserve set for my friend as the sets were not so expensive. As a result, the lost time can be compensated. What we see here is the 'value' of time,money and scope being adjusted in the context. Before, I end this post. Instead of rhetorically asking you this question, I would like to ask you this instead. ..
YJ actually waited more than 30 minutes before we all arrive. Actually, have two more friends but they too shy to be featured in the video. recording. thanks. haha. yeah, like writing songs..but singing still need find singer.lol. Hey Sean, thanks for dropping by at iWorld Blog earlier on and dropping a cool comment. Appreciate it! All the best to you too, love your take on the McD McValue Lunch for the blogger's contest as well. Hello. Thanks for dropping by my blog. I see, you're a UTAR student too huh? Read that somewhere in your blog that you were completing the some UTAR project paper. I assume that's your thesis right? Is this your final year? Yeah, final year now.. next year graduating, hopefully. haha.cool, dint kno u r utar student also. hheehe. looks like got prospect. Thanks for your comment. I edited my blog using paint leh~!.. But i think yours is unique~!!! haha. paint good enough i guess if u hv skill.. THanks. Good efforts, great info, superb values! I like ur question : Why glance? 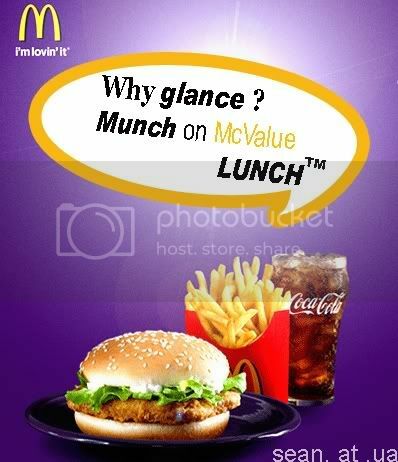 Munch on McValue Lunch - it is very catchy.. just luv it! Thanks.. for deliberating this post.. appreciate it alot! yeah.. will check out yr site soon.